The village of Sobotište is located in western Slovakia close to Senica in the Myjava hills. The first mention of the village can be dated back to the year 1251 as Zobodycha. Since 1297 it has belonged to the Branč, since the 16th century to the families of Amadeus, Hédervárys, Nyáry, Zichy, Vietoris and others. In 1530 the small town received the right to have a town market. In the mid-16th century the Habans settled here, who gradually built a farm there. Under their influence, craft production developed. In the first half of the 19th century, several small mills and breweries operated here and viticulture grew. 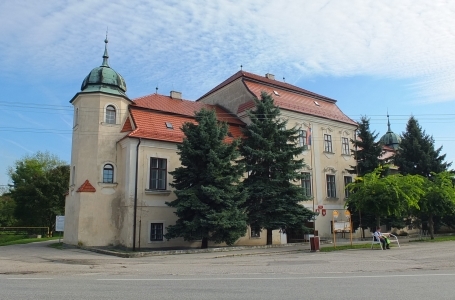 The village is well known in cultural circles because it is the birthplace of the first actress of the Slovak National Theatre of Nitra, Anička Jurkovič (1841). 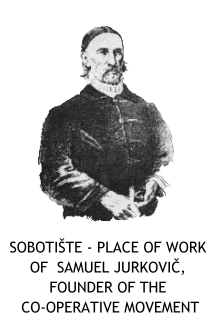 Samuel Jurkovič significantly influenced the economic and cultural life of local inhabitants by founding in 1845 the Farmers’ Club (Gazdovský spolok) - the first credit co-operative in Europe. The village of Sobotište currently has 1,600 inhabitants. The dominant feature of the square is the renaissance-baroque church which now houses the town hall, a library and the renovated co-operative museum of Samuel Jurkovič, which bears witness to the important activities of this local teacher. Inside there are precious documents and photographs on display offering visitors the turbulent history of co-operatives in Slovakia both in Slovak and in English. Visitors can also see here the workplace of Samuel Jurkovič. In the front there is his desk with an open book, probably the accounting book, with a list of the first members of the Gazdovský spolok. Moreover, in the museum we can also see a current selection of the production of various Slovak co-operatives. The Co-operative Union of the Slovak Republic, based on existing co-operative traditions as well as co-operatives’ needs, has prepared within the reconstruction of the co-operative museum a new exhibition of almost 160 years history of the co-operative movement in Slovakia. The aim of the exhibition is to inform the public, but particularly young people and foreign visitors about the historical roots of the co-operative movement in Slovakia. The museum is in addition to the classic three-dimensional exhibits equipped with the latest audiovisual devices.